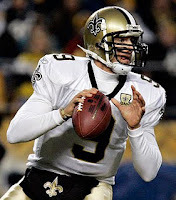 The New Orleans Saints marched over the Detroit Lions in New Orleans 45-28 Saturday night, in another record setting performance, Drew Brees completed 33 of 43 passes for 466 yards and 3TDs, the 466 yards being the most in a playoff game. the Saints gained a total 627 yards on offense. Darren Sproles ran for 2 TDs with 51 yards in 10 carries. The Lions scored first on a 10 yard Touchdown to Will Heller for the only score in the first Quarter, The Saints Darren Sproles ran for a 2 yard TD to tie the game at 7-7, the Lions added a 13yd touchdown pass from Matthew Stafford to All Pro Calvin Johnson, who would end up with 2TDs and 211 yards receiving, to make it 14- 7 Lions, New Orleans added a field goal to make it 14-10 Lions at Halftime. The Saints went on a scoring spree in the second half with 2 TDs in the 3rd Quarter and 3 TDs in the 4th. Saints Coach Sean Payton said the records are great,but there focus is on winning. Matthew Stafford Threw for 380 Yards and 3TDs but it was not enough to keep up with the high Flying Saints. Jim Swartz Lions have lost 7 straight post season games including this one, there first post season game since 1999. The New Orleans Saints will now travel to meet the San Francisco 49ers next Saturday, Jan 14 in the second round.